Watch those French drivers ! All signed up. Hope you�ll make it this far! Well we made it to the south coast. Currently camped up at a place called Arcanchon or some such like. Shoud be in Spain before noon tomorrow. Will try to do photos then. where are you headed? I used to spend time in a friends villa at rocha brava near Carvoeiro, a charming fishing village right in the heart of Algarve, in the south of Portugal. Weather is looking good for Asturias Simon so fingers crossed. See you Thursday - we'll be around so any time is OK. Crossed the border yesterday and stayed at Castro-Urdiales with a great view of the Atlantic but sadly not Wifi. Can�t do photos at the mo cos my card reader isn�t working but maybe later. 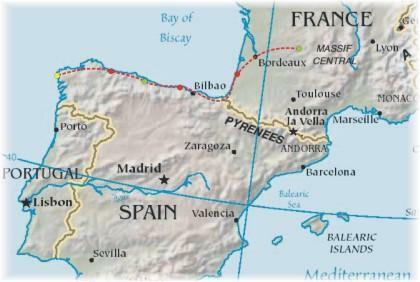 We are now at Ian & Luis� about halfway along the coast and hoping to reach Portugal by Saturday. The boys are loving it and the roads aren�t too busy so the journey is going well. Thats good mate, glad to see it is going well, and good to talk to you on skype. Turns out I didn't put my USB key through the wash after all so will sort some more pics in a bit. Got some great pics of the Cathedral coast so Thanks Luis for recommending that one. We stayed at a campsite right next to it. Pricey where is your place? I need a lemon for my tequila! Go down the motorway till you get to the IC8, turn left. Keep on that road for about 20 miles then take the first turn to Pedrogao Grande, go up past the builders Merchants, then take the first left to Fontainhas, go down 1/2 a mile. When you hit the first S bends you are there, it is on the left, you cant miss it, big barn lots of olive trees etc... The car park is on the second right hander, on the left. Nicked some of your oranges. It was Irene recommended Picasa. I'm not usually open to photo storage websites but as it is by Google and totally free I had a play. I'm well impressed with it.